Bold colors finally come out of hibernation as soon as we exit the dreary winter months and start prepping for warmer days and brighter colors. Color blocking is a great yet bold way to show off your excitement for spring while remaining on-trend. For those of you who are unfamiliar with this concept, color blocking is pairing “mismatched” or unconventional color combinations that would normally be worn with a neutral. The trick to this trend is to keep it bold; the colors complement each other only when they are in bold blocks. So here are a few tips and ideas if you want to try something new this season. 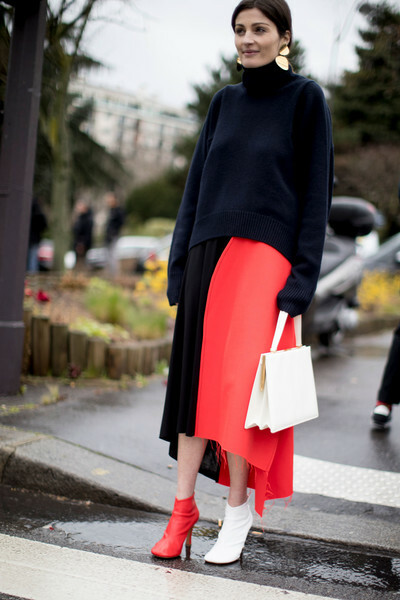 Color blocking can look very high-end, but only when done right. The idea is to make a statement with the bold colors so try to tone down other elements of your outfit. Keep textures similar and make sure your accessories complement your look, not take away from it. Statement Shoes are a Must! You can totally nail this trend with one easy step: mismatch your shoes to your outfit! Make sure what your wearing is the same color or the same color palette and then go crazy with the shoe selection. If you want to make sure your outfit has some sort of combining element, then that’s where accessories come in handy. You can use jewelry to help break up the color so it’s not too bold or you can add a clutch that is within your color palette to help complete the look.